Getting married on a beautiful Florida beach can make memories that last a lifetime, both for the fortunate couple and those in attendance. A Florida beach front wedding is special because of the sheer beauty of the setting. Many brides have had a unique and wonderful Florida beach wedding that was inexpensive, but breath-taking. Exchanging vows under a soft Florida morning sun, smelling the clean salt air, and feeling the sugary white sand beneath your feet is the stuff romance is made of. You can have these same romantic moments, as well as a cheap beach wedding, with some careful planning. It will require some tedious WORK on the phone and through email, and you may have to meet with several different people yourself, but if it can save you $1000's of dollars, it will be worth it. It helps to start looking into a cheap beach wedding the minute it pops into your mind. No...really, hear me out. There can be a lot of loose ends that must be snug to make your special day run smoothly...and even then, there will STILL be problems that crop up, but you can do it...and save yourself $1000's of dollars. * The first thing to do is know yourself well and be honest with how you handle frustrating situations such as slow service, unreturned calls, inaccurate information, and rude shop owners. This is what beach wedding planners deal with every day...and why they charge excessive prices. * Enlist a support group of sharp, hard-working, and unflappable people to help you. If "Mother" and "Aunt Tilly" have short fuses, they MAY NOT be the best choices for front line work. * Take an hour with your most trusted friend/confidant/advisor and write down everything that you think needs to be covered in planning a wedding. Now, come back to that list the next day (with your friend, if possible) and then, once more a week later. In between, checkout the Internet, bridal magazines at the public library, or purchase an inexpensive guide to a cheap beach wedding. * Be aware, none will give you ALL of the answers you are looking for, but collectively you will unearth some real nuggets to save yourself $1000's. Combing through material like this can be tedious, but it is well worth it. * Learn all you can about the legalities of getting married on the Florida beach. Make sure you know how Florida marriage license laws work. * Have your marriage license handy to give to the person officiating the wedding. Make sure you GET IT BACK. * If you want to use a personal minister or officiant to perform the marriage, they MUST be licensed in the State of Florida. Strong planning for a beach wedding makes a huge difference in the result. Yes, there will be times when it is frustrating and even draining, but you can do it...and make things turn out great! *Different counties and cities on the Florida beach have different ordinances. Know your locale. For example, in St. Augustine, flower petals CANNOT be thrown. * Tell guests to NOT bring birdseed to the beach. Your beautifully planned Florida beach wedding will be assaulted by hundreds of shore birds. * Favorites at cheap Florida beach weddings include bubbles to blow at the new couple or tiny, tiny shells to throw. * Your beach wedding dress should be short. The sand will snag material on a long dress and you will NEVER get salt water out of it if it gets splashed by the ocean water. 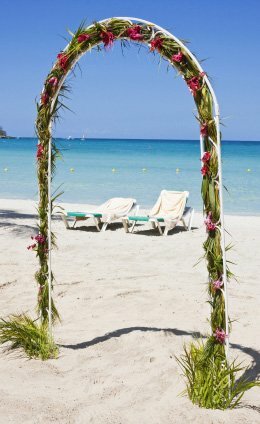 * ALWAYS be on the lookout for cheap beach wedding ideas no matter how trivial or hokey they may sound at first. Think each one through. Write down ALL information. * Many popular locations for Florida beach weddings get booked up for "sunset weddings." You can can have a memorable beach ceremony in the early morning, and serve fruit, cold cuts, bagels, and juice for breakfast at your reception. * Weather is always a consideration for Florida beach front weddings. Make sure you have a Plan B if it looks like rain. Some brides even consider getting "wedding insurance." * A cheap Florida beach wedding is casual, outdoorsy, and lasts only about 20 minutes. You can save $1000's of dollars on decorations, reception rental, and food. Many places, like the Florida Shell Shop here on Treasure Island, give great discounts to brides. You can have a beautiful, but inexpensive beach wedding on the Florida coast. Careful planning, attention to detail, a good sense of humor and strong "forgiveness skills" will help you achieve it. You can do it!